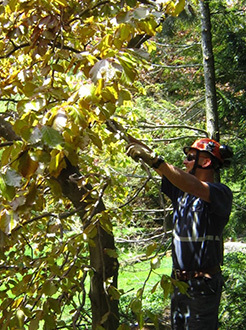 Tree pruning is important in establishing healthy, well formed trees, shrubs and hedges. Our tree specialists prune to remove diseased branches as well as deadwood and stubs that serve as a breeding area for insects and fungi. Crossing branches, water shoots, sucker growth and branches forming weak attachments are removed whenever possible to eliminate potential failure. This also enhances health, structure, and the aesthetic value of the tree. 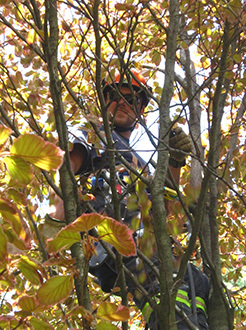 The lower canopy of the tree may be raised by removing lower branches as needed. If necessary, the trees may also be selectively thinned for better circulation of light and air. Clearances can be provided for buildings, driveways and sidewalks. Proper tree pruning at early stages of tree development promotes good tree health in addition to being cost effective. 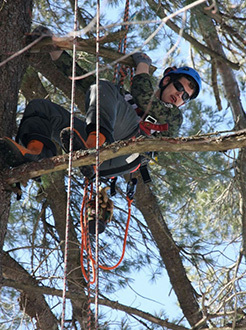 Tree pruning should be performed every three to five years. Trees that are transplants, injured by construction or diseased may require more frequent pruning to remove any deadwood that occurs. It should be noted that improper pruning can cause significant damage or death to your trees. Your trees are far too valuable to risk having them damaged by inexperienced or unqualified individuals.